Snapshot: This article reviews the scope and definition of several different types of isolation precautions for nurses, in addition to the diseases and conditions that are required by each set of precautions. Should be used with all patients. Always wash hands before entering and before exiting the patient’s room. Always cover mouth and nose with arm or tissue when coughing or sneezing. Wear clean, non-sterile gloves and gown if contact with bodily secretions is likely. Wear mask and eye protection if splashing with bodily fluids is likely. All patients, regardless of the diseases they may or may not possess, require standard precautions. Cutaneous anthrax. Note: inhalation anthrax requires Airborne precautions. Hepatitis (all types). Note: infants in diapers and incontinent elderly patients may also require Contact precautions. Human Immunodeficiency Virus (HIV). Note: If a patient’s T-cell or CD4 cell counts are low, he or she may also require Neutropenic Precautions. Used for patients who carry diseases that are transmitted by contact with bodily fluids and secretions and/or by contamination of inanimate objects (fomites). Always wear clean, non-sterile gloves and gown when entering room; remove before and discard before exiting room. In addition, follow all Standard Precautions: Always wash hands before entering and before exiting the patient’s room. Always cover mouth and nose with arm or tissue when coughing or sneezing. Wear mask and eye protection if splashing with bodily fluids is likely. No special precautions for dishes/utensils. Only keep essential supplies in room; bag linen in the client’s room. Door to room may be left open if needed. Transport client only when essential. Place client in clean, non-sterile gown and cover with clean, non-sterile sheet during transport. Any wounds or abscesses with uncontained drainage. Infants (wearing diapers) and incontinent elderly clients may also require Contact Precautions, even if they do not carry a disease that specifically requires Contact Precautions. Used for patients who carry diseases transmitted by infectious droplets. Always wear a surgical mask when caring for the patient. In addition, follow all Standard Precautions: Always wash hands before entering and before exiting the patient’s room. Always wear clean, non-sterile gloves and gown when entering room; remove and discard before exiting room (i.e. not in the hallway). Always cover mouth and nose with arm or tissue when coughing or sneezing. Wear eye protection if splashing with bodily fluids is likely. Door to room may be left open if necessary, because infectious droplets typically only infect individuals within 3 feet of the patient. Visitors may be allowed in the room if they wear surgical masks and maintain a distance of at least 3 feet from the patient. Transport client only when essential. 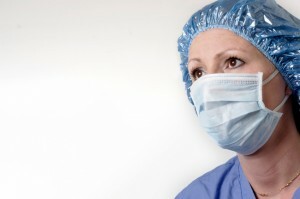 Place a surgical mask over the client’s mouth whenever outside the room during transport. Influenza / “the flu” (both H1N1 and seasonal). Note: H1N1 influenza also requires Contact precautions. Used for patients who carry diseases transmitted by the airborne route. Healthcare professionals must always use a N-level (95, 99, or 100) level respirator or a powered air purifying respirator (PAPR) when caring for patients. Single room must always be maintained under negative pressure; door must remain closed at all times except for entering and exiting. In addition, follow all Standard Precautions: Always wash hands before entering and before exiting the patient’s room. Always wear clean, non-sterile gloves and gown when entering room; remove and discard before exiting room (i.e. not in the hallway). Always cover mouth and nose with arm or tissue when coughing or sneezing. Wear gown and/or eye protection if splashing with bodily fluids is likely. Visitors may only be allowed in the room if they wear an N-level respirator or powered air purifying respirator (PAPR). Use dedicated or disposable equipment (i.e. stethoscope and sphygmomanometer) when available. Varicella (Chickenpox). Note: Varicella also requires Contact precautions. Used to protect patients (not healthcare professionals) who are immune-suppressed. Provide private room whenever possible. No fresh flowers in room. Limit foods that may contain bacteria (pepper, unpasteurized milk or dairy products, raw or roasted nuts, raw or dried fruits, raw or undercooked meat or seafood, fresh salad dressings containing raw cheese, etc). Follow all Standard precautions. Always wash hands before entering and before exiting the patient’s room. Always wear clean, non-sterile gloves and gown when entering room; remove and discard before exiting room (i.e. not in the hallway). Always cover mouth and nose with arm or tissue when coughing or sneezing. Wear gown and/or eye protection if splashing with bodily fluids is likely. Human immunodeficiency virus (HIV), especially when the patient’s T-cell and CD4 cell counts are low. Organ transplant recipients (who are receiving immunosuppressive medications).